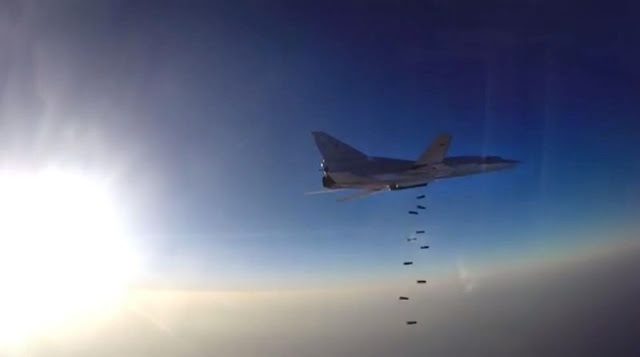 An image grab created on August 16, 2016, from footage released by the Russian defence ministry reportedly shows a Russian Tupolev Tu-22M3 conducting an air strike in Syria. BEIRUT - Russian air strikes killed 14 civilians as they were crossing the Euphrates river near the jihadist-held town of Mayadeen in eastern Syria, the Syrian Observatory for Human Rights said on Friday. "They were crossing the river on makeshift rafts in a village south of Mayadeen," Observatory director Rami Abdel Rahman said, adding that three children were among those killed overnight. Russia has in recent days intensified its air raids in support of Syrian regime forces battling jihadists across the country. Abdel Rahman said the civilians were fleeing the village of Mahkan, south of Mayadeen, which lies about 420 kilometres (260 miles) east of Damascus and is one of the Islamic State group's main remaining bastions. Mayadeen has been under IS control since 2014, when the group swept across swathes of Iraq and Syria and proclaimed a "caliphate", but regime forces this week advanced to within five kilometres (three miles) of the town. Russian air strikes killed 14 civilians as they were crossing the Euphrates river near the jihadist-held town of Mayadeen in eastern Syria, the Syrian Observatory for Human Rights said on Friday.